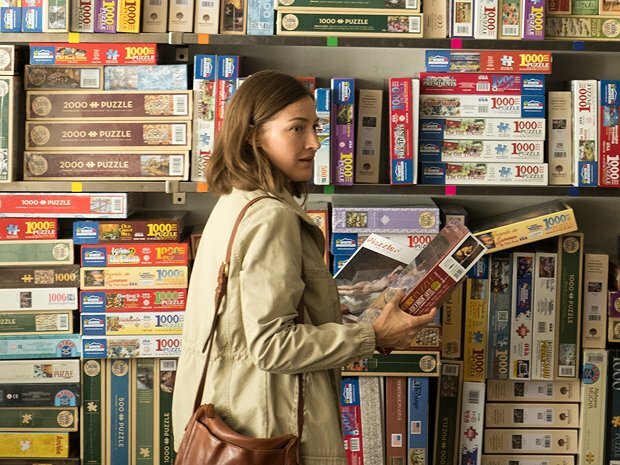 To read the summary plotline of Kelly Macdonald's new film Puzzle – which tells of a suburban housewife and mother from Bridgeport, Connecticut, who finds meaning in life through the world of competitive jigsaw puzzling – it's possible to imagine the kind of whimsical affair which would make Wes Anderson proud. Yet instead, this remake of the 2010 Argentine film of the same name is a thoughtful realist drama, tied together with a quietly masterful performance from its lead. 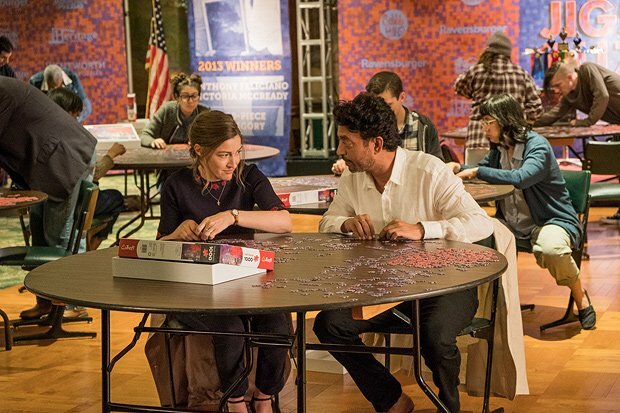 The directorial debut proper of producer Marc Turtleaub (whose credits include Little Miss Sunshine and Safety Not Guaranteed; he also directed a version of Marie Phillips' novel Gods Behaving Badly in 2011, although it wasn't generally released), Puzzle pulls off a neat balancing act. It bears a movie-of-the-day accessibility, but blends it with a refreshing abstinence from melodrama and an extremely subtle relevance to today's concerns. Agnes' marriage to mechanic Louie is loving, in a way, but characterised by a duty and subservience brought on by small town tradition where women are concerned. Her chance of a revived life in the big city is instigated by her new puzzling partner Robert (a shabbily cultured Irrfan Khan), summing up the much remarked-upon town-versus-city divide in America. Although in a far less notably flashy production, Agnes' is a strong part which feels just as significant to Macdonald's career as No Country. A prolific and diverse actor, her work until now has consisted of ensemble pieces and strong supporting roles; only the kind-of shared lead with Bill Nighy in David Yates and Richard Curtis' 2005 ecological television drama The Girl in the Café and her lead voice character in Disney/Pixar's Brave (2012) have come as close to illustrating her ability to carry a film. I begin to tell her about the Guardian's review of Puzzle, which I had seen that morning, and which suggested that within the British film industry she might be under-rated… 'I think I'm rated just fine!' she shoots back, with mock indignation. Okay, not under-rated, more under-valued. The key review quote is 'Compare how vital Kelly Macdonald was to 1996's Trainspotting with her cursory presence in 2017's boysy sequel, and you'll have some sense of how the British film industry has underestimated her', which also nails how Danny Boyle's film wasted its most interesting character and performer. Yet with Puzzle, Macdonald shows a deft and effortlessly commanding ability to lead a film, which is a job she's rarely been trusted with until now. 'Yeah, I realise I've been given an opportunity that I know many other actresses higher up the echelons could have had,' says Macdonald, sidestepping with graceful diplomacy. 'I'm grateful to be given the chance. Puzzle will go on general release later this summer. Agnes (Macdonald) is a housewife whose life revolves around routine, until she discovers a flair for solving jigsaw puzzles. Macdonald is divine as ever, but the film rarely digs deep into how such a modest pursuit can bring someone back to live. Charming but slight.